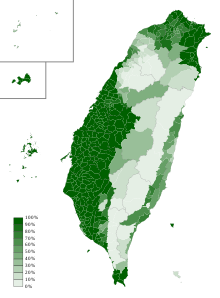 None, درحقیقت status in Taiwan as one of the statutory languages for public transport announcements and for the naturalization test in Taiwan. Ministry of Education in Taiwan and relevant NGOs in Taiwan. ↑ They are the most common pronunciations while there is another one cited from OxfordDictionaries.com، /hoʊˈkiːn/، which is almost never used actually.